Are all Tuchfelds related? Was our great-grandfather correct? Can he be proven right? Where do we start? How do we start? We need to do this in an organized, logical, scientific way. Where will we document the data we collect? We started in OneNote (Microsoft’s version of Evernote) making a “to do” list, planning the Tuchfeld Project. We also created a relevant link list, so we could easily find websites that we need to use. Then we examined all records we had already acquired related to the project. Over time we have acquired vital (birth, marriage and death) records and census records for our grandmother’s immediate family. We needed to look at these again to make sure we weren’t missing any important information. Jacobson and Jacobson Genealogy Researchers http://www.bocafengshui.com/genealogy.html Jewish Genealogy Researchers in Boca Raton and online. We had a few spare minutes and decided to start a one-name study. 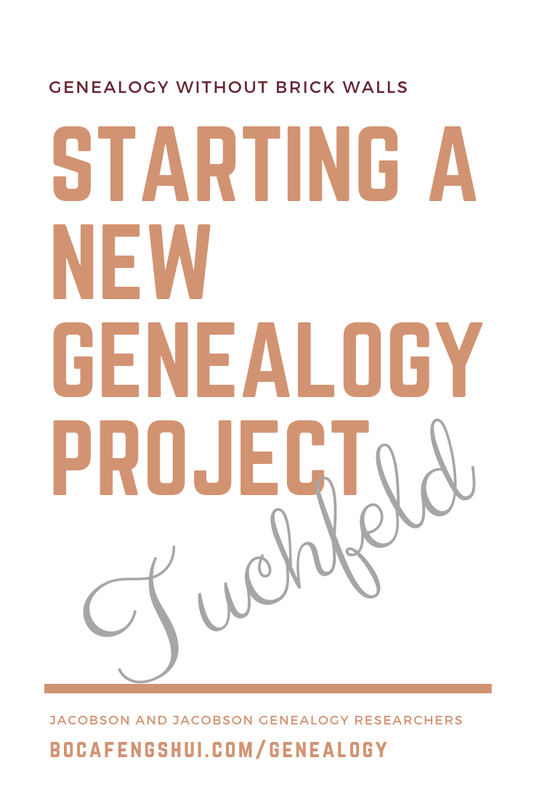 When we were kids we were told by our maternal grandmother that father told her that everyone with the last name of Tuchfeld was related. Over years of life and research we have bumped into many Tuchfelds whose connection to our family was unclear. We realized that it was not a common name so we tried to save a record when we discovered it. 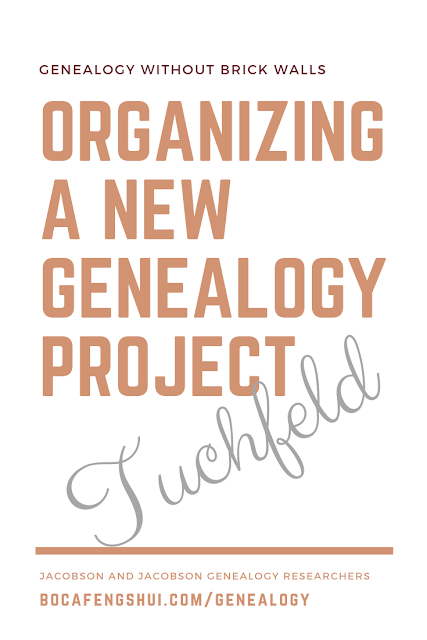 Sure it’s a rare name, but are all Tuchfelds related? We decided to gather as much evidence as possible and see if this could be proven or disproven. Jacobson and Jacobson Genealogy Researchers http://www.bocafengshui.com/genealogy.html helping you grow your family tree. Often when researching, you find a family member listed in an index. It is tempting to just accept the information in the index and continue researching. That is never a good idea. Whenever possible, it pays to look for and examine the record that is indexed. Besides the additional information that you will learn from the record, there are often errors in the index that can only be found by looking at the actual record. Check to see if the names are spelled incorrectly or reversed or just completely incorrect, genders are incorrect, ages or dates are wrong, place names are wrong or if there are other major errors in the indexing of your record before you copy your family's information into your files or program. Indexes are very useful, but they are only a guide to finding the actual records. The actual records are the real source of information for your tree. Sometimes the original records are complex because of format, language or handwriting. That is when you need to hire a professional to examine the records and extract and synthesize the vital information for you. We were searching through the LDS microfilm of Philadelphia birth records looking for our grandmother's birth certificate. Instead of finding her birth certificate, we found an unexpected treasure. We stumbled upon the birth certificate of one of her siblings, previously unknown to us. This clue led us to her death certificate. She was born and died in between U.S. Census years, so she does not appear in any other records. Searching birth records can often be genealogically profitable. They often lead to clues that lead us through a trail of other records and help us grow our family tree. Jewish Genealogy Researchers in Boca Raton and online. Jacobson and Jacobson Genealogy Researchers have posted a new article on our website. Please visit http://www.bocafengshui.com/genealogygalicia to read it and learn about the Galician Record Images that are Online. Indexes of Galician Jewish records have been online for many years. This article tells you how to find images of Jewish Galician vital records through JRI-Poland. Free images of your family history could be just a click away. Here's the beginning of the article, to get you started: For more than ten years JRI-Poland http://jri-poland.org has been indexing records for towns formerly in eastern (Austrian) Galicia, now Ukraine. The original records are held in the AGAD Archive in Warsaw, Poland. JRI-Poland has online searchable indexes of births, marriages and deaths for more than 90 Galician towns. 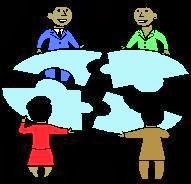 Please visit http://www.bocafengshui.com/genealogygalicia to read the rest of the Jewish Genealogy article. specializing in Jewish Galician Genealogy Research. When we were younger we used to spend a lot of time doing jigsaw puzzles. Searching for the right piece to fit into the empty spaces and filling in all of the holes are so fulfilling, challenging and addictive. Sometimes doing genealogy is like working on a family puzzle. This week we have been searching through an index (brief abstract) of records from our grandfather's town in Eastern Europe (Galicia). Our search has helped us find more information about relatives that we already have in our family tree. We have been able to add marriage, birth and death information and source citations for many relatives. This led to us finding additional children for many couples already in our family tree. This has helped us flesh out the family tree even more. Most importantly, we found the name, birth year and death year of our grandfather's youngest sister. Before starting our research, our grandfather told us that his parents had eight children but he only knew the names of three. Now we know the names of all eight. Filling in all of these pieces of the puzzle is not only intellectually stimulating, it is genealogically important. These people are family and they deserve to be documented and remembered.